Libyan army renegade general, allegedly connected to the CIA, has threatens to “spread” war to neighboring Algeria. 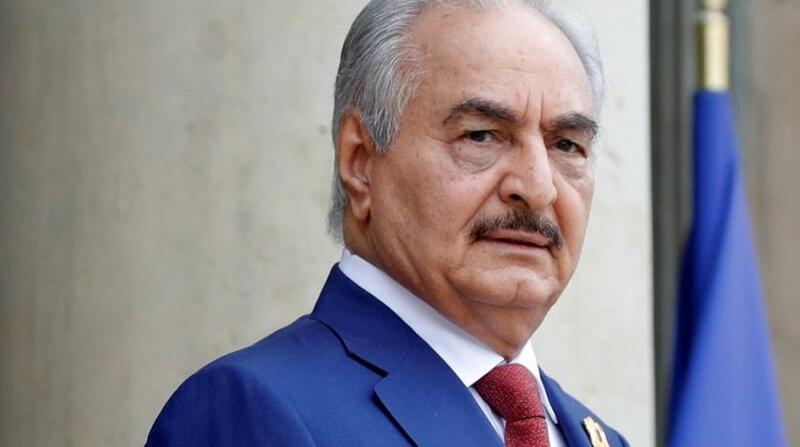 In a video circulated on social media over the past 48 hours, Libyan National Army (LNA) Commander Khalifa Haftar was seen saying that the “war could be spread, in moments, to the Algerian border.” Algiers “was exploiting” the security situation in Libya, he said. The general who has aligned his resistance in the country with the eastern parliament and government based in Tobruk also accused Algeria of sending soldiers to Libya, similar to what happened at the beginning of the Libyan crisis in 2011. Algeria was then accused of dispatching “mercenaries and weapons to save the Gaddafi regime from collapse”. This weekend threat is not the first. In 2014, Haftar had accused Algeria of trying to seize Libya’s wealth. The Soviet-trained Khalifa Haftar took part in the coup that brought Gaddafi to power in 1969 and served in the Libyan army under Muammar Gaddafi. He commanded the Libyan contingent against Israel in the Yom Kippur War of 1973. Haftar has been described as “Libya’s most potent warlord,” having fought “with and against nearly every significant faction” in Libya’s conflict, and as having a “reputation for unrivalled military experience. The Algerian foreign ministry has yet to respond to the LNA commander’s threats. Posted by Khalid Al Mouahidi on September 10, 2018. Filed under Zoom. You can follow any responses to this entry through the RSS 2.0. Both comments and pings are currently closed.